Home »Bucks County Technical High School»Winners at State DECA! 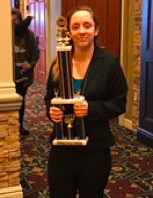 Congratulations to Junior, Caitlyn Wos for First Place over­all in the Job Interview Competition and con­grat­u­la­tions to Senior, Dave Jn Pierre for 3 First Place Technical medal­lions in the Sports and Entertainment Marketing Event. It was a great rep­re­sen­ta­tion of BCTHS! Good luck to those attend­ing the DECA International Career Development Conference in Orlando, FLA from April 26th to May 1st. Next → Next post: Automotive Experts!